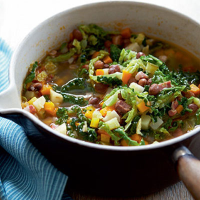 This recipe comprises 2 of your 5 a day, uses seasonal vegetables and at just £1.15 per serving. In a large saucepan, heat the oil, then add the onion, garlic, pancetta, carrots and celeriac, and cook over a low heat for 10 minutes until soft but not browned. Add the tomatoes and courgette and cook for 5 minutes. Stir in the cabbage and beans, and add 1,250ml of water. Season and bring to the boil. Simmer for 10 minutes until the vegetables are tender. Check seasoning and serve in warm, deep soup bowls. Serve the classic Italian way with a drizzle of extra virgin olive oil and a spoonful of freshly grated Parmigiano Reggiano, or stir in a tsp of pesto to each serving.